There seems to be just as many bird feeders available for purchase as there are birds. Which feeder is the best? 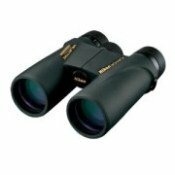 Well that all depends upon several factors such as where your feeder will be located, what kind of birds you wish to attract, if there are any predators or pests that can get to your bird feeders, just to name a few. We have gathered some of the best rated, most liked feeders according to customer reviews on pages specific to the type of bird feeder you would like to get for your backyard, apartment deck or patio, place of work or wherever you would like to have one. 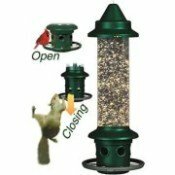 Some of the types of feeders include tube, platform or tray, window, hopper and specialty feeders such as hummingbird, oriole, bluebird, thistle/Nyjer, mealworm, suet and squirrel proof bird feeders. Some people enjoy decorative feeders or making their own. Tube Feeders - Depending on the size of the seed ports and how you configure this type of feeder (with or without perches, tray or no tray attached), you can attract a wide variety of birds with this type of feeder. Hopper Feeders - A gravity type feeder where seed is enclosed in a main chamber and bird seed is let out slowly from the bottom into a tray as birds feed. Platform Feeders - This type of feeder is the most non-specific type of feeder and will attract many different types of birds, big and small. It is considered one of the messiest types of feeders. Window Bird Feeders - People enjoy these types of feeders because it brings the birds up close for viewing. Typically doesn't hold as much seed as other feeder types, but there is one on the market that makes refilling and cleaning easy. There are feeders that are mirrored and in house style which makes them even more enjoyable. Oriole Feeder - Attract Orchard, Bullock's, Hooded and Baltimore Orioles to your backyard bird feeder with fruit feeders by offering oranges, nectar and grape jelly. Best Squirrel Proof Bird Feeder Review & Comparison -For those who have trouble with squirrels stealing bird seed, here is a review of the best squirrel proof bird feeders including Brome Squirrel Buster, Heritage Farms Absolute II, Homestead Super Stop-A-Squirrel and the ever so popular, Droll Yankee Flipper. Squirrel Buster Plus Bird Feeder Review - Here is an in-depth review of one of the best-selling squirrel-free bird feeders that really works and outwits even the slyest squirrels. Hummingbird Feeders - Specialty feeders for a sugar solution with tiny feeding ports to attract hummingbirds. You can make your own solution by using this hummingbird food recipe. 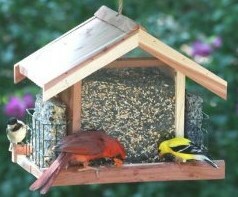 Peanut Bird Feeder - Attract even more bird species by putting out a peanut bird feeder in addition to other feeders. Angel Bird Feeder - For those who want a heavenly touch to your backyard bird feeder. 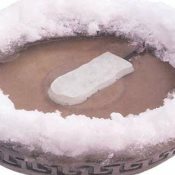 Precautions against Disease -Protect birds against Salmonellosis, Aspergillus fungus, Avian Pox and others. Preventing Bird Window Collisions - Millions of birds are killed by window collisions. Follow these tips to keep birds safe from windows. Precautions against Cats - Keep cats indoors. They kill millions of birds every year. The Cats Indoors! campaign has some great information for cat owners and info to give to your neighbors if you don't own a cat yourself. If you like the idea of homemade bird feeders and would like to build your own feeder, then go to our bird feeder plans page. Check out this awesome Bird Feeder Cam to take photos and videos at your bird feeders.